I'm reviewing Laura Terry alongside Dakota McFadzean because they're two graduates of the Center for Cartoon Studies who produce the most consistently beautiful and haunting minicomics. Terry is the student (probably alongside Chuck Forsman) whose work has improved the most since their first CCS comics til now. The wit and storytelling sparkle was always there for Terry, but it took a while to figure out how to find a style that suited her and then play to her strengths as an artist. McFadzean came into CCS fully-formed as an illustrator, but the quality of his writing has become richer, deeper and more enigmatic. 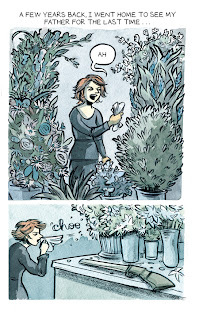 Terry's Shotgun Funeral is a short comic that manages to cram in some charming scenes of one friend trying to comfort another in a cemetery with her account of her father's funeral. In just sixteen pages, Terry is able to give the broad strokes of an emotional breakdown and the beginnings of recovery, thanks to the friend's story about a family friend sitting at their house with a shotgun during the funeral. What's wonderful about this comic is the way Terry closely follows the body language of her characters to reveal mood and wisdom. While the despondent young man mopes around, the young woman runs around, trying to catch fireflies. The comic is all about letting go feelings that hold us back, as she liked to think that the shotgun story was really about guarding the house from her father's spirit coming back to a place where it would be easy to stay, given that it needed to move on. Terry's brush strokes here are nice and simple, more about creating shapes than trying to sculpt figures. That shape creation allows her bright and bold use of color to take over and tell the story, both in the muted flashback sequence and the cheerier present-day sequence. Her Xeric-grant winning Overboard exercises some different storytelling muscles. 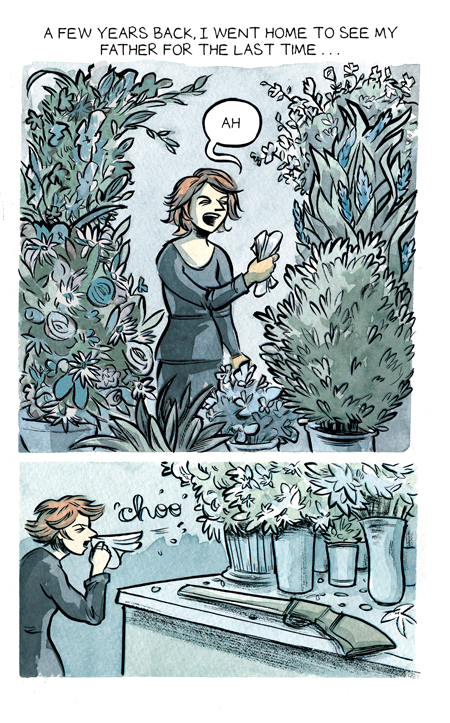 Her brush is even freer and more scribbly in this comic and her use of color more expressive. This is a funny and strange story about a nightmare n the form of a nervous breakdown...or something far stranger and more sinister. The unnamed, redheaded protagonist (another extension of Terry, perhaps?) starts the story on a boat that is dashed to pieces by a vicious storm. She barely survives, but she is unable to save her girlfriend. She wakes up gasping, only to hear a faint sound of music and see the impossible: a tiny whaling ship that views her as its target. The image of the protagonist in the shower hearing "Thar she blows! ", only to find a harpoon penetrating her foot, was both hilarious and unsettling. Things devolve further from there as the protagonist gets more and more paranoid (being fueled by codeine and booze doesn't help), drives her girlfriend away and has to hold on for dear life once again under the most surprising of circumstances. Overboard is a success viewed as a metaphor for paranoia as well as a work of magical realism, and once again Terry's use of color (I believe she used colored pencil to striking effect) drives the narrative. The color here is more ragged than in Shotgun Funeral; taking away a level of slickness gives the story an emotionally raw quality. The simpler and more direct Terry is in her working methods, the more fully realized her comics have become. 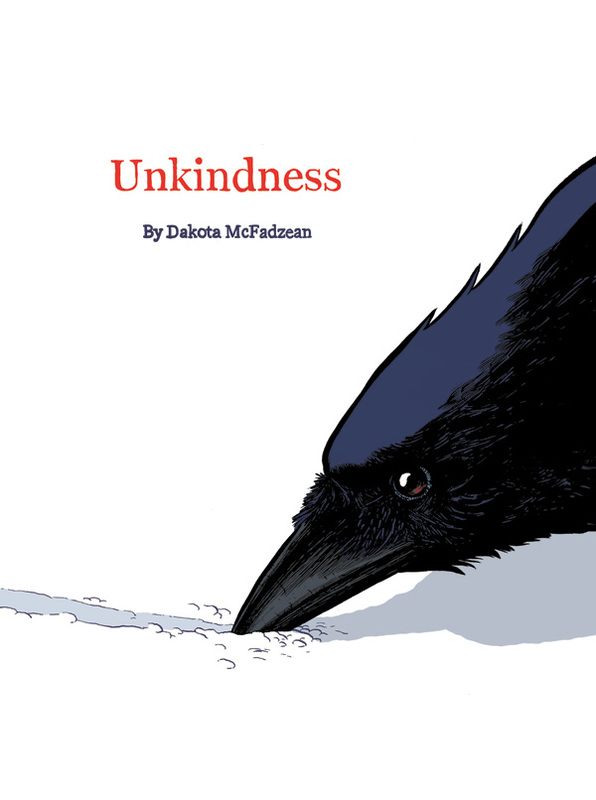 McFadzean's Unkindness is typical of his work in that it depicts small town life in Canada in an entirely unromanticized fashion and also contains unexplained elements of magical realism. While there's a strong streak of naturlaism running through his work (the world he creates feels quite solid and real), his character design is looser and more expressive. He allows for a certain rubbery quality of reality that gives him the opportunity to mold and bend it. An "unkindness" is what is referred to as a gathering of ravens, and there is indeed a mysterious and surprising visitation by the birds in the dead of winter. The birds observe, feed and even communicate (one says "goodbye" to a little boy), often by creating a series of mysterious lines and circles in the snow. The title also refers to small acts of unkindness in the story, leading up to a mother essentially telling her teenaged daughter that she was a mistake. There's a sureness to the way in which McFadzean flips from character to character in this story, each of whom are just trying their best to get by in life without a whole lot of happiness or fulfillment. There's also a sort of hidden momentum and tension in this story generated by the wild card factor of the birds and the hidden emotions that well up as the story unfolds, exploding in a manner that was unexpected. It's also a story about different entities being at cross-purposes and being unable or unwilling to fully communicate their desires. That's made literal in the mystery of the ravens--there's no real sense of what their purpose is or if they mean harm to the humans in the town, but it's also expressed in the way that characters talk past each other. 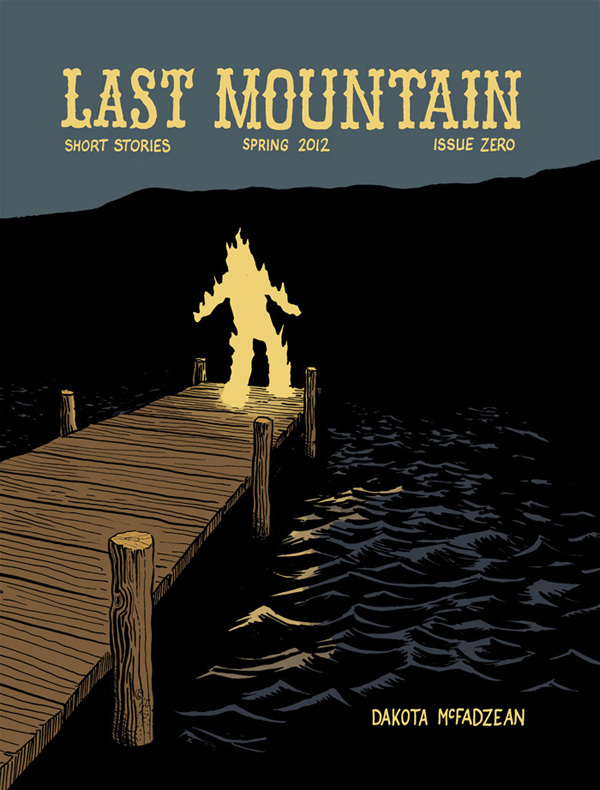 Last Mountain #0 is his one man anthology of short stories. "Grey" is a short horror story about a man and woman running through a forest where all its animals have become petrified, as they are trying to outpace some kind of spreading, unseen force. It's an atmosphere piece devoted to creating a feeling of dread and then irrevocable loss. "War of the Old World" is one of McFadzean's few true humor pieces, and even this one has a rather ghastly punchline. Seeing him wring every ounce of sentiment out of an immigrant's story only to subvert it with a carefully developed but still shocking gag was quite a way to end the issue. "And The Horse You Rode In On" is the anchor of this comic. It's an Archie pastiche that features extended segments about a lone horseman riding out on the prairies by himself, relishing his solitude. This is the daydream of a nebbish who is manipulated, abused and/or ignore by school administrators, fellow students and his parents. He has a laughable lack of agency even as he's drawn to fit in a kind of Archie-verse, content to flit from embarrassment to embarrassment even as he refuses to truly knuckle under to anyone else's desires. There's a delicious, unresolved tension at the end of the story where the protagonist is given a chance to renounce his "purity" once and for all with a bag of weed that was given to him, but it's unclear what path he will choose. Both McFadzean and Terry are ready for long-form work, and any publisher would be lucky to have them. 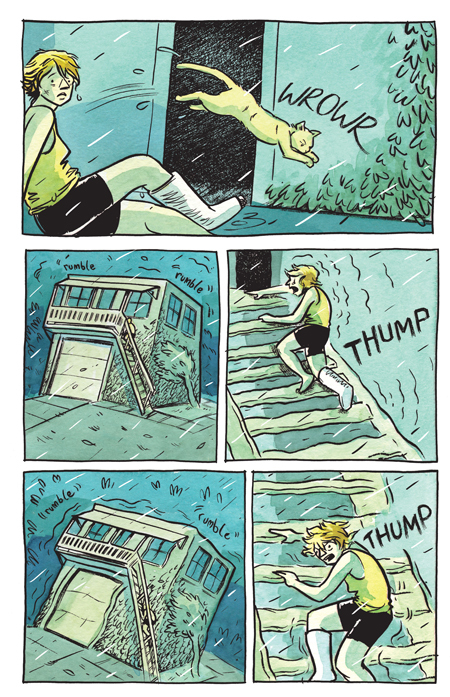 I really like Dakota McFadzean's comics, too. He's definitely a rising star. Did you pick up Irene? It's a new mini-anthology that debuted at SPX. If not, it's worth tracking down not only for Dakota's story, but also Andy Warner, who is another outstanding new artist. Some Ramblings On Are You My Mother?